1. Are you insured ? ​​​​We are fully Insured. We also recommend that you have your pet insurance. 2. How do I know I am leaving my beloved pet with a trustworthy person? 3. What is the check in and check out time? Our check in is 1pm and check out time is 1pm however we are quite flexible and early drop of will be charged at £5 for 1st dog and £2.50 for additional dogs of same family per hour before 1pm for check out the same will apply . 4. How do I know my dog will be happy for a whole two weeks whilst I'm away on holiday? If your dog is staying for a long period I advise a 'trial' day visit and maybe an overnight stay, prior to your holiday. This will ensure your dog is comfortable in the environment and let your little one get to know us. We can talk about the best way to settle a nervous dog or a dog who's never stayed away from home before. 5. How are charges paid? 6. I have never left my dog before and am worried about his/her reaction. 7. Will my dog be Socialised? Yes. All our guests have the option to interact with my dogs and my family who are all dog lovers (no children) We occasionally attend small dog meets and fun shows, so providing your dogs are social and friendly, (and you are happy for us to do so) we will attend these events. 8. Where will my dog sleep? Your dogs will sleep depending on their preference. 9. Do you need to see proof of Vaccinations? Yes. We need to check that your dog has been wormed and that all the required vaccinations and health checks have been carried out. Puppies accepted over 12 weeks with full vaccinations. Dogs showing signs of illness will be segregated for their own and others protection. 10. What do I need to provide on checking in? The Tiny Paws Pad requires up to date vaccination certificates only. We can provide all the warm snuggly beds and blankets, but to make your little one feel happier we suggest you bring their own beds and blankets. food and water your little ones may need. However, if you wish to bring your dogs favourite toy and their food bowl, to make their stay a little more ‘homely’ that will be fine. 11. How many dogs will be staying? We offer a one to one personal service to your dog, so we only have a very limited amount of spaces. Dogs from other families may be staying at the hotel. ( usually only during cross over pick up / drop off periods Integration will be careful and monitored. 12. What will my dogs day be like? We have lots of play sessions throughout the day both inside and outside (weather permitting) We love walks in the park and use our local parks, also enjoy country walks. 13. What happens if my dog needs regular medication? I have experience with medicating a dog regularly so I have no problem with this. Just leave me clear instructions and I will be happy to follow them exactly. 15. What happens if my dog gets ill or needs a vet? 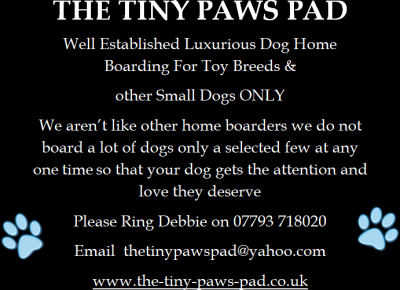 The Tiny Paws Pad use a local reputable vet which is also the only animal hospital in the area. All vet bills incurred from treating your animal will be the owners responsibility and must be paid in full when collecting your dog. Unless the vet advises the dog to be kept in, we will bring your little one home and care for them as if they were our own. We will contact you and keep you informed at all times. 16. Are there any rules regarding my dog? Dogs must be socialised with other dogs and people. We do not take aggressive dogs. Dogs must be house trained, unless they are puppies. (who we expect them to make little mistakes!) We cannot take persistent barkers as we live in a residential area. 17. What will be my dogs routine?